Scottsdale, March 18, 2019 - Two Phoenix-area companies, Saccadous, Inc. and Systems Imagination, Inc. (SII) have teamed up in a partnership to advance the latest technologies in the application of eye tracking to interpret human brain function. Saccadous uses high-speed eye tracking to diagnose and track neurological problems, such as traumatic brain injury (TBI) and dementia. Systems Imagination uses artificial intelligence (AI) and machine learning to help healthcare companies discover hidden insights in big data. Together the two companies intend on accelerating the meaningful interpretation of subtle changes in human eye movements that may reflect higher level cognitive function such as intention, and the signals that indicate impairment in neurological disease. The eyes have it, as the saying goes. Eyes have long been used by medical professionals to diagnose a wide range of diseases and conditions, many of which are not directly related to vision. New technology is expanding the scope of these diagnoses to include a range of neurological problems that can be difficult to identify objectively. For example, consider the problems related to concussion injuries as the result of head impact. Many smaller impacts can be as damaging as one large one, but in other cases, a patient might not be affected by the impacts. In 2015, we wrote about a company that was studying tiny eye movements as a source of diagnostic data. Saccadous has since developed their technology further. Even more importantly, the company has conducted clinical research that clearly demonstrates the effectiveness of their system. The three graphs above are from a case study for a college basketball player. The player sustained impacts to both the front and back of the head during a game, and reported temporary blindness and double vision. The top left graph shows the baseline data that was recorded for this player at the start of the season. The eye movements were symmetrical for both the left and right eyes as they followed a moving target. Three days after the injury, the right eye clearly was not responding as it had, as shown in the second graph. Eight days after the injury, the third graph shows that the right eye tracking movements had recovered nearly to their original state, and the player was cleared to return to play. Saccadous also has data showing how the eye movements can be used to predict the risk of falling for patients with Parkinson’s Disease. They can help diagnose progressive supranuclear palsy (PSP), and even Alzheimer’s disease and cognitive impairment. The fact that these claims are now be backed up by scientific research results helps advance the use of this technology. This underscores the need for clinical research to prove the value of any new health technology. Fortunately, we have entered a stage in this complex market where companies understand the need for such research, and are working hard to accumulate meaningful data to demonstrate the value of their products. Saccadous Inc. is making progress on its virtual reality eye-tracking technology to track concussions. A 2014 spinout of the Barrow Neurological Institute, the Scottsdale-based company is collecting data and refining its software and online-based platform for analytics and reporting. "To that end, we added our technology into five ongoing trials/institutional review boards — not just here locally but across the U.S.," said Craig Caffarelli, CEO and co-founder of Saccadous. In August, the company baseline tested 100 college athletes before their fall sports season. Shortly after the baseline testing, one athlete suffered a severe head injury and was hospitalized. Saccadous re-tested that athlete three times and found a major difference in eye tracking abilities. There's been movement among other eye-tracking competitors. Last December, Google bought Eyefluence and Facebook bought the Eye Tribe, while Apple recently bought SensoMotoric Instruments. Those acquisitions created partner and investor interest as well as momentum in the industry, Caffarelli said. "We are very excited about the capabilities that a virtual reality environment combined with 3-D stimulus has now given us," Caffarelli said. "Using a VR headset, we can now control the light for pupil tests, expand and control the subjects' field of view, and have digitalized tests that require 3-D — like a near point convergence test." 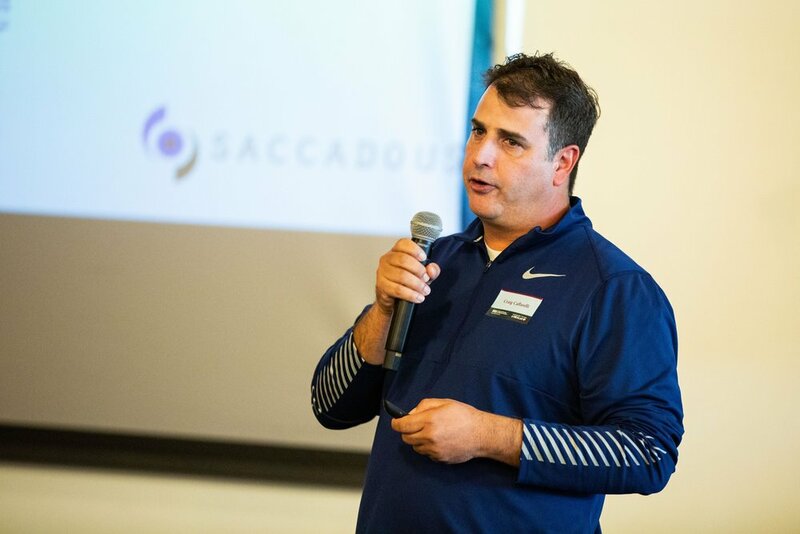 For the past two years, Saccadous had worked with Scottsdale-based TBI Diagnostics to incorporate TBID's concussion expertise. This summer, Saccadous acquired TBID, gaining its intellectual property and licensing deals in exchange for stock in Saccadous, Caffarelli said. Today, the combined companies employ five people. Cox Business, in partnership with Startup Tucson and Idea Funding, selected six finalists for the 2017 Get Started Arizona business pitch competition. Each startup will have three minutes to deliver their best pitch “Shark Tank” style to an illustrious panel of small business experts to win a $25,000 prize package. Audience members will vote for their favorite startup to receive the Audience Choice Award and $1,000. Tucson residents can register to join the live audience free at www.getstartedaz.com. Tuesday, October 17 from 5:00 p.m. to 9:00 p.m.
Finalists include Oat Mama, PlasmaGlide, Saccadous, Hivemetric, Emagine Solutions Technology and Lum.AI. Scottsdale - April 13, 2017 - Researchers from two Scottsdale based companies, SMART Brain Aging, Inc. and Saccadous, Inc. are seeking men and women between the ages of 65-75 to participate in a Mild Cognitive Impairment (MCI) research study to determine the effectiveness of cognitive exercises designed to reduce or stabilize the symptoms of dementia. Participants will also help validate and test new innovative methods of early diagnosis. A person with MCI is at an increased risk of developing Alzheimer's or another dementia. Mild cognitive impairment causes cognitive changes that are serious enough to be noticed by the individuals experiencing them or to other people, but the changes are not severe enough to interfere with daily life or independent function. Research indicates that 1 in 3 men and 1 in 2 women will suffer from dementia by age 85. Researchers from Barrow’s Neurological Institute (Dignity Health) have discovered new methods for diagnosing and differentiating neurological disorders by measuring characteristics of involuntary eye movements, called microsaccades. Clinicians from Smart Brain Aging have identified new cognitive exercises that have the potential to curb the effects of dementia. The duration of the study is one year, and a minimum of 100 subjects will be required to participate. Individuals who elect to participate may be required to participate in one of four groups which requires weekly appointments for cognitive therapy. Volunteers must be Phoenix or Scottsdale residents and able to travel by car to an appointment site near Chaparral and Scottsdale Road. The study begins in May 2017 and concludes mid-2018. Participants have the opportunity to help advance research that is potentially disruptive and has the potential to reveal ground-breaking innovation in both the diagnosis and treatment. For more information about this study, contact us at 1-855-B-SMART-Ø. Ashley or Mona will assist in scheduling interested participants. Trace shows us what happens to a player's brain during those hard tackles and what's being done to keep the athletes safe. Sports organizations increasingly are looking for better concussion detection methods, and a sense of urgency has grown with the release of the 2015 film “Concussion” starring Will Smith on the problem of chronic brain injury suffered by American football players. When players take a hit, “they will always say they are fine,” said Adam Gross, chief executive of Bethesda, Maryland-based startup RightEye, which has developed a one-minute eye-tracking test that helps reveal the extent of trauma to the brain. RightEye says its test — with a specially configured computer that monitors how quickly the eyes follow moving objects — can be useful for monitoring someone recovering from a concussion. Eye movement offers insight into brain health and brain trauma, and can also help detect other disorders such as dementia or Alzheimer’s disease, according to the company. “This can be used in the locker room, but it is more valuable in helping people recover from a concussion,” said RightEye president Barbara Barclay. Steve Devick, an optometrist who helped develop the test in the 1970s as a tool to diagnose learning disabilities and later helped adapt it to diagnose concussion, calls it a “proven” detection system which can be simply administered in less than two minutes. Devick said many professional sports teams — including the National Football League, America’s most popular sport — still use “seat of the pants” methods for concussion diagnosis such as asking questions or requiring a player to follow finger movements. “All NFL games will have four or five doctors on the sidelines but you can still sometimes see a player go back on the field who is obviously concussed,” he said. Such concerns were raised at last year’s Super Bowl, when Patriots’ star Julian Edelman returned to action even after he appeared disoriented. The NFL, which has implemented a “concussion protocol” for suspected brain trauma, announced at the start of the season it would be evaluating new technologies including from the Illinois-based King-Devick group as part of player safety efforts. The King-Devick test requires an athlete to read single-digit numbers displayed on cards or on a tablet to test “saccadic” eye movement — very fast, almost imperceptible movements from one eye to the other — which according to research can be used to diagnose concussion and other neurological disorders. Arizona-based startup Saccadous is developing a tablet-based system which, unlike those of RightEye and King-Devick, tracks involuntary “micro” eye movements. He added that using this system measuring involuntary “micro-saccades” is better than a cognitive test which can be gamed by athletes who want to return to action. “Our goal would be to have a baseline of every player in a healthy state, so we know if we scan them again, we could compare it against the baseline,” he said. NCAA, the governing body for US collegiate sports, in January reached a settlement with athletes to provide $70 million for research in concussion testing. Data collected will help improve detection and provide a foundation to improve helmet design and ratings, according to Stefan Duma, head of Virginia Tech University’s department of biomedical engineering and mechanics, which is working on the research. The University of California at Los Angeles meanwhile is using a grant from the NCAA and the Department of Defense to use “big data” to assess concussion injuries and recovery. The goal “is to develop scientific, evidence-based tools that will enable doctors to more accurately gauge when it is safe for an athlete to return to play,” UCLA neuroscientist Christopher Giza said in announcing the program last year. New York University researchers meanwhile developed an app which works with Apple’s HealthKit platform to measure signals on how a concussion patient is progressing. By seeing daily variations in a person’s stride, heart rate and ability to concentrate, “we are no longer bound by visits to the doctor’s office,” said Paul Testa, an NYU researcher on the project and emergency room physician. “There is some evidence that possibly we’ve been wrong in putting athletes at complete rest after a concussion,” he said. As chief architect for AT&T in Phoenix, Craig Caffarelli is a volunteer mentor at Arizona State University, both with startup companies at SkySong and with students in entrepreneurial classes at the W.P. Carey School of Business. When he heard ASU’s Furnace Technology Transfer Accelerator program was looking for some new ideas to fund, he jumped at the chance. The program made available 100 patents from ASU, Northern Arizona University and University of Arizona, as well as some intellectual property from Mayo Clinic and Dignity Health. Hungry entrepreneurs are encouraged to sift through these patents and intellectual property, which the institutions aren’t using, to come up with innovations for ASU to help fund. SCOTTSDALE, Ariz.-- A simple eye scan could be the key to detecting a neurological disease. Scottsdale start-up company Saccadous developed a new eye-tracking system. It uses a scanner about the size of a remote control that attaches to a computer, iPad or large phone. It could find the first sign of something wrong in the brain.